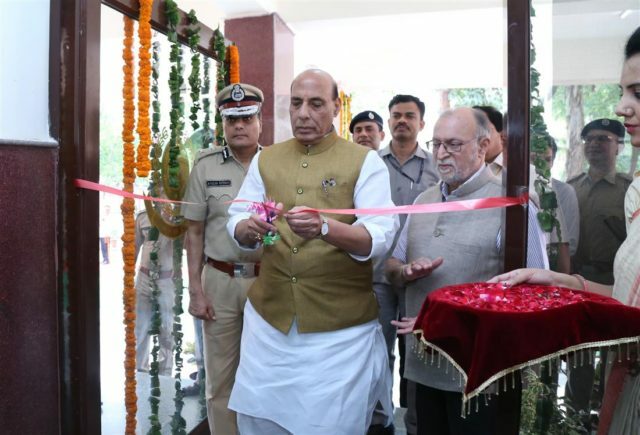 New Delhi: Union Home Minister, Shri Rajnath Singh, inaugurated the building of the Office of DCP South- West district, Police station Delhi Cantt & Delhi Police Residential complex, here today. He also presided over the induction ceremony of the all-women SWAT team of Delhi Police. The Lieutenant Governor of Delhi, Shri Anil Baijal, Delhi Police Commissioner, Shri Amulya Patnaik and senior officers were present on the occasion. Addressing on the occasion, Shri Rajnath Singh said that construction of new complexes strengthens the basic infrastructure of the department, which leads to new energy in the personnel towards their duty, finally benefitting the citizens. He said that the society has a lot of expectations from Delhi Police and to meet these expectations, it needs modern working place and good working environment. He said that success of any organization depends on its infrastructure to an extent. Keeping this fact in mind, the Government has increased the fund allocation to Delhi Police from Rs 6378.18 crore in 2017-18 to Rs 7426.98 crore in the year 2018-19, resulting in an increase of 15%. Government has sanctioned procurement of Facial Recognition System for the Crime Unit and 2,700 handheld devices with SIM Card for equipping constables with e-beatbook. The Union Home Minister expressed happiness over the fact that the Delhi Police has raised an All-Women SWAT Team by inducting 40 women Commandos for Anti-Terrorism duty under the Special Cell. 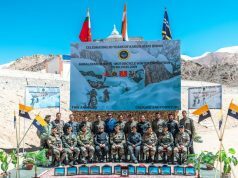 This team has been trained by NSG, he added. Mentioning that the women SWAT commandos will be deployed during the Independence Day celebrations, Shri Rajnath Singh congratulated Delhi Police for this initiative in the direction of women empowerment. 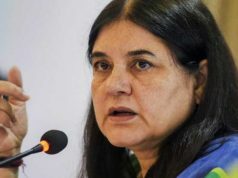 He further said that Delhi Police has given an opportunity to women to prove themselves by entrusting them with new responsibility. He also said that all these women police personnel belong to the North Eastern states and he termed it as an example of integrating various regions in Delhi Police. He also appreciated Delhi Police for providing free self-defence training to about 3 lakh female students/working women and housewives, thus making them independent. Keeping in mind the safety of women, he said that Rs. 10.13 crore have been released in 2017 for security initiatives including self-defence training to women. 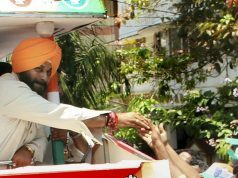 He also said that representation of women has increased in Police after the Centre’s decision to provide 33% reservation to women in police force at the constable to sub-inspector level in the UTs including Delhi. The Home Minister said the citizens got benefitted by many other important schemes of Delhi Police. He quoted examples of ‘Eyes and Ear Scheme’ Prahari Yojana, Operation Milaap, Anti Auto Theft App, Online PCC, Senior Citizens App and Last Report. All these schemes indicate new approach and modernization of Delhi Police, the Home Minister said. He said that a proposal to recruit 12,000 additional personnel in Delhi Police is under consideration, out of which, he added, approval has been given to recruit 3,139 police personnel. Besides, the Government has created 4,227 posts in the year 2016 and another 3,139 posts this year while separating the Crime Investigation from the Law & Order functions with an aim to improve the conviction rate. Shri Rajnath Singh said that Delhi Police, being the police of National Capital, needs to play a lead role. It should become a role model for the police of other States and UTs and the practices adopted by it should be among the best practices of police. He also stressed upon the perceptional change of police. To fulfill this objective, the Home Minister directed that the senior officers should also go on patrolling with jawans on some occasions and motivate them to adopt a public friendly approach while taking part in their policing activities.